Mark your calendars! 2016 Fundraiser Is Coming Up! We will be holding auditions on July 24th from 10 am until 2 pm. At 255 Great Arrow in the Manny Fried Playhouse/Subversive Theatre. If you want to come back or have never worked in theatre- we look forward to seeing you!! Costume, make-up, acting, set work…please visit or contact. Developing Our Board Of Directors! Beth & Vienna would like to welcome their newest board member, Susan Barlow, Executive Director of Parent Network of WNY! Susan brings so much to the table. Our 2016-2017 season will be fantastically successful thanks to her experience in both the special needs community as well as her connections in the city of Buffalo. UP! is now Unique Theatre Company. Same great company. Fresh new face. We’d like to give a heartfelt “Thanks!” to Unique Theatre Company’s supporter Maria Aldona Laurendi for donating her time and talent by creating our delightful new logo. We hope you all love it as much as we do! Face it, nobody likes to be bullied and we all have a little anxiety. FACE IT is comprised of two separate plays. Respect, a short play written by Engelic Everett introduces the audience to Sherry, a young woman -proud of her Down Syndrome- who is bullied both at home and at school. How she faces and resolves her inner pain is heartwarming. Day Tripper, a play written by Nick Cacciotti has us traveling by elevator with Dylan, a young man with great anxiety who is fearful of just about everything. 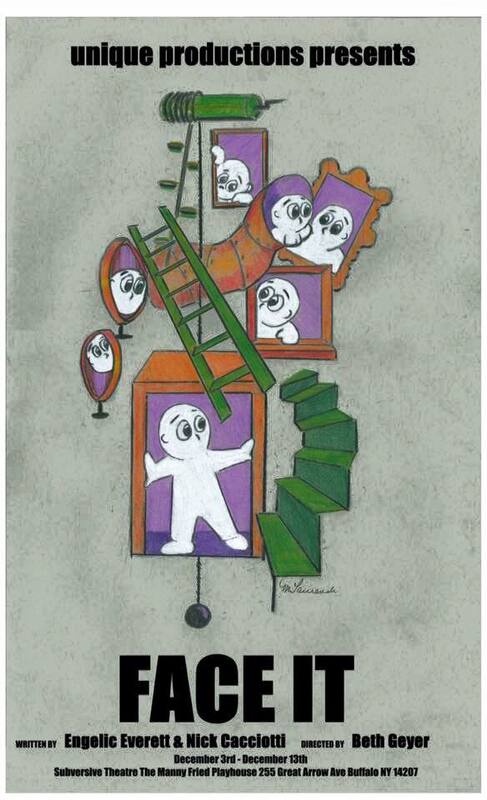 His day trip into a multi-level building allows him to work through his fears and anxieties and in the end find love. In both stories, each main character faces their fears and anxieties face on. Face it: we’ve all been there at one time or another. FACE IT opens on Thursday, December 3, 2015 and runs through Sunday, December 13, 2015. General admission tickets are only $15 and can be purchased online at uniqueproductionsup.com/upcoming-production, by phone 716-243-8889, or via email at uniqueproductionsup@gmail.com. Don’t miss this two part production written by Engelic Everett & Nick Cacciotti, directed by Beth Geyer, and starring a fantastic cast loaded with fresh talent & charisma that will keep you captivated throughout all the comedy & drama that FACE IT promises to deliver! Pre-purchased tickets and reservations are highly recommended. Cash & check only at the door, credit cards accepted for advance sales. For more information, please contact UP! 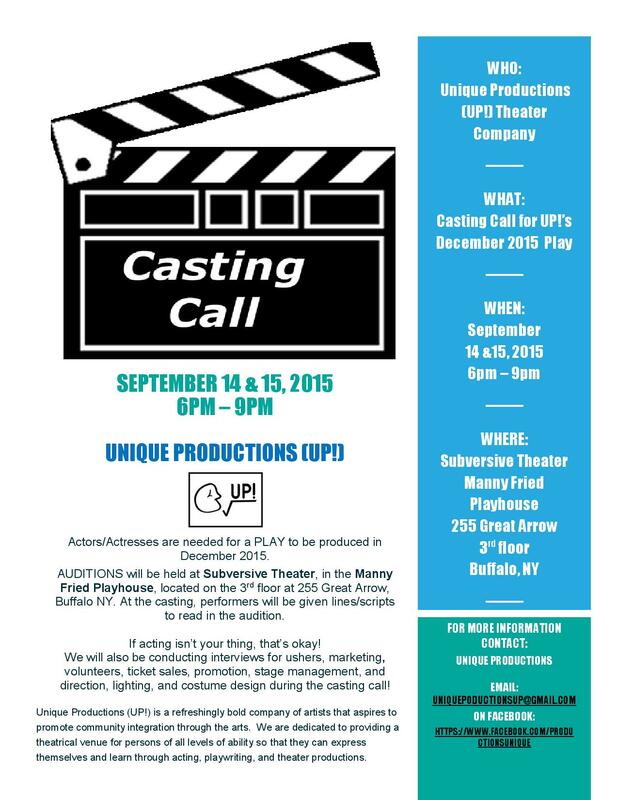 at 716-243-8889 or uniqueproductionsup@gmail.com. Proudly owned & operated by Beth Geyer & Vienna Laurendi Haak, Unique Productions (UP!) is a unique company of artists that aspires to promote community integration through the arts. UP! is dedicated to providing a venue where persons of all levels of ability can learn and express themselves through art, playwriting, and acting and more. UP! is comprised of aspiring and/or working playwrights and actors who have an interest in giving voice to persons with disabilities, as well as changing current cultural perceptions of what it means to be a person with disabilities. Save the Date! UP! Presents Face It!